Morris County -- taken from Hunterdon County by Act of Colonial Assembly of 1738-9 -- included within its limits territory now forming Sussex and Warren Counties. It was named after Lewis Morris, Governor of the Province. Settled by emigrants from Long Island. In Colonial days known as South Hanover, subsequently as Bottle Hill and in 1834 named Madison by vote of the people. In 1780, when the British tried to surprise Washington at Morris town, they reached Bottle Hill, but snow, rain, and hail made the road impassable, and they were compelled to retreat. Sayre House. Ridgedale Avenue, built in 1745 by Daniel Sayre. Opened to Continental officers and soldiers during Revolution. Used by General Anthony Wayne as headquarters while the army was in camp at Loantaka Valley. Bottle Hill Tavern, 127 Main Street. Building originally stood at Main Street and Waverly Place. Removed to present location 1923. Owned and occupied by Madison Historical Society. Presbyterian Church organized about 1752. Four miles north of Morristown. Site of first Presbyterian Church in Morris County erected about 1718. 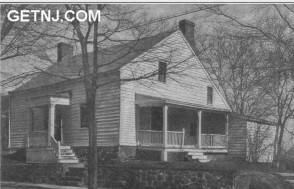 First military company in Morris County was formed in the vicinity of Whippany in the Fall of 1775, under the command of Captain Morris. About three and one-half miles east of Madison. Talmadge Homestead, where Washington was a guest. Shepard Kollock's printing house where New Jersey journal was published. Opposite Morrell House. Morrell House. East Main Street. Opposite Presbyterian Church where Washington frequently stopped. Day Mansion. Elmwood Avenue. Site of present Ogden Memorial Church. Hamblin House. Northeast corner of Main Street and Elmwood Avenue. Home of Mrs. Hamblin, where Gen, eral Lafayette was entertained in 1825. Bonnell Homestead. Watchung Avenue. Home of Mrs. Bonnell, who baked bread all night to provide soldiers sleeping on her floors with food for their march to Yorktown, Virginia. Chatham Bridge over Passaic River. During the winter of 1779-80, New York Bay froze to such an extent that the British Cavalry could cross to New Jersey. Chatham Bridge was guarded day and night to prevent the British reaching Morristown, Washington's Headquarters. The bridge was also the scene for the exchange of Prisoners. Dickerson Tavern. Spring and Water Streets. Scene of Court Martial of Benedict Arnold, presided over by General Robert Howe. Campfield House. 5 Olyphant Place. Scene of courtship of Elizabeth or Betsy Schuyler by Alexander Hamilton, 1779-80, occupied at time by John Cochrane, Surgeon General of the Continental Army. The house is now owned by the Morristown Chapter, D.A.R. Open to public free of charge Tuesdays and Fridays throughout the year. Tempe Wick's House. Jockey Hollow Road. Frame house occupied by Wick family. Made notable by exploit of Tempe Wick who hid her horse in her bedroom for three days. Liddell House. Jockey Hollow Road. Built of stones used in the fireplaces of the soldiers' huts in the Revolution. Fort Nonsense. On western outskirts of the town is a high hill known as Fort Nonsense. Site of series of earth-works built by order of General Washington to protect encampment from possible assault. Because the earth-works were never used, the hill received the name. Site of earth-works marked by boulder erected by Washington Association of New Jersey. Sun-dial erected by Morristown Chapter, D.A.R., on the grounds of Memorial Hospital, where in 1777, at an open air service of the Presbyterian Church, General Washington partook of Holy Communion. Monument on jockey Hollow Road erected by Morristown Chapter, D.A.R., in memory of Captain Adam Bettin, Tenth Pennsylvania Regiment, shot in the mutiny of his troops, January 1, 1781. Stone boulder placed on the Morristown Green by Morristown Chapter, D.A.R., to mark the site of the County Court House and jail standing in the Revolution. Stone erected by Morristown Chapter, D.A.R., on grounds of the Presbyterian Church to mark site of original First Church where General Washington worshipped while living in Morristown. Speedwell. Home of Samuel Morse and Alfred Vail, where the first successful experiment in electric telegraph was made in 1838. Monument in the burying ground of the Old Presbyterian Church erected by Morristown Chapter, D.A.R., in memory of Revolutionary soldiers buried there. Camp of Stark's Brigade, Kemble Mountain. Stark's Brigade encamped on the southeastern slope of Mt. Kemble. A monument built of stone has been raised on the side of the mountain from stones included in the chimneys of the Revolutionary Soldiers' huts. Burnan Park. Site of fortification and signal station. Hoyt's Corner. Tablet to Peter Kemble. Tablet erected by Morristown Chapter, D.A.R., near center of village marking route of Washington and his army to Morristown after Battle of Princeton. Tablet erected by Morristown Chapter, D.A.R., showing route of Washington and his army to Morristown after Battle of Princeton. Founded in 1713. Six and one-half miles southwest of Morristown. Site of mutiny of Pennsylvania Line, January, 1781. Hill Top Church, left side of Main Street, built about one hundred years ago on the site of the original church erected 1745, which was used as a military hospital in the winter of 1777. 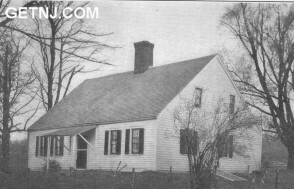 Black Horse Tavern, built 1745 by Ebenezer Byron. 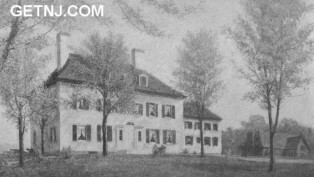 Drake House is situated about one mile from the village on the road to Morristown. Headquarters of Colonel Robinson and Chevalier Massillon in the winter of 1779-80. Loantaka Valley, now called Spring Valley, one and one-half miles southeast of Morristown. Site of Washington's encampment after the Battle of Princeton, Washington being quartered in Arnold Tavern, his first headquarters at Morristown. Furnaces at Hibernia and Mount Hope, under the proprietorship of Charles Hoff, Jr., and John Faesch, supplied shovels, axes, refined iron ore, cannon balls, grape shot, etc., for use of the Continental Army. The employees were exempted from enlistment. Ruins of the Iron Works still to be seen. Site of parsonage of Rev. Jacob Green, Pastor of the first church erected at Hanover. His home was here from 1746 to 1790. Elected to the Provincial Congress, which adopted the Revolutionary Constitution. An early opponent of slavery. Parsonage is still standing near the Hanover post office. Beaverwyck, home of Lucas Von Beaverhoudt. Noted for its hospitable entertainment of soldiers, both British and American during the Revolution. Practically a neutral ground. Tradition says that Major Andre first saw Washington here. The house is now the home of Sarah Condit.